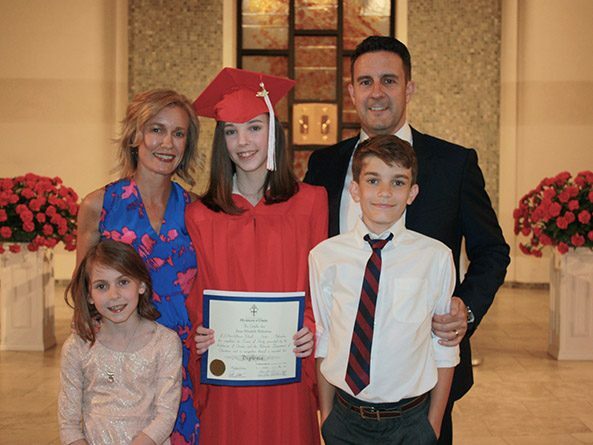 Above: Sen. Theresa Thibodeau with her husband Joseph and their children Eleanor, Anna and Joey at Anna’s eighth grade graduation last year. Not long after Omaha Sen. Theresa Thibodeau was appointed to the Nebraska Legislature last fall, Thibodeau’s daughter Eleanor, a fourth grader studying Nebraska history and government, asked her for help with a question on a homework assignment: What are the duties of a state senator? Those are the duties Thibodeau threw herself into preparing for during the 75 days between her appointment by Gov. Pete Ricketts in October and the first day of the legislative session on Jan. 3. First she read the Legislature’s rules. Then she brushed up on the Nebraska Constitution. She met with local political leaders and constituents in her north-central Omaha district to ask how she could best represent them in Lincoln. She also consulted her sister and best friend, Omaha City Councilwoman Aimee Melton. It was while fundraising and scheduling events for Melton’s campaign in 2013 that Thibodeau’s interest in politics grew. Thibodeau said Melton encouraged her to accept the governor’s appointment, and they speak often about how to balance their time between their families, businesses and duties as elected officials. Next, Thibodeau dug into the state’s most recent budget to understand how it works. She said working with budgets is something she learned after opening the Primrose School of La Vista, a day care and preschool, in 2014. “I have to make sure that I can balance my budget at the end of the year and that I’m fiscally responsible and that I can go back to the families at my school and justify the reason for the money that we’re spending,” she said. Also a board member of the La Vista Community Foundation and Big Brothers and Big Sisters of the Midlands, as well as a member of the Sarpy County and Greater Omaha chambers of commerce, the senator said her business and nonprofit experience will help her represent her constituents, many of whom are small business owners. “Being a small business owner myself, I know firsthand the struggles that they go through in trying to not only get their business open but keeping it running,” she said. Thibodeau and her husband, Joseph, a cardiologist, decided to start Primrose after she chose to stay at home following the birth of their second child. Thibodeau, who studied developmental psychology at the University of Nebraska at Omaha and spent eight years working in human resources and benefits consulting, wanted to ensure that area families had a day care option like Primrose, which emphasizes preparing kids for school and instilling a love for learning and good citizenship. Thibodeau is picking up lessons after only a few days of participating in legislative debate. She said debate sometimes lasts longer than it needs to but that voting tends to happen quickly. She said other senators gave her some useful advice: Be your true self. Thibodeau spent a lot of time preparing for session, but she said she is looking forward to learning much more about how the Legislature works now that the process is underway. “There’s still a big learning curve there,” she said. Thibodeau knew she could answer the question about a senator’s duties back in October, but she encouraged Eleanor to do her own research. Since then, Thibodeau, Eleanor and her two other children, Joey and Anna, have had many discussions about her new role and what an honor it is to serve in the Legislature.